The Director General of Dubai Municipality Hussain Nasser Lootah has revealed ambitious plans to construct 3D-printed buildings in the city, while acknowledging an outlandish proposal to build a tower suspended from an asteroid orbiting the earth. “[A skyscraper hanging from an asteroid] is an imagination of an architect, but everything is possible in Dubai,” Hussain Nasser Lootah told Arabian Business. He was speaking as he revealed the civic body’s plans for a major 3D-printed project, details of which are being kept under wraps for now. “We will be making an announcement in the next two months,” said Lootah. 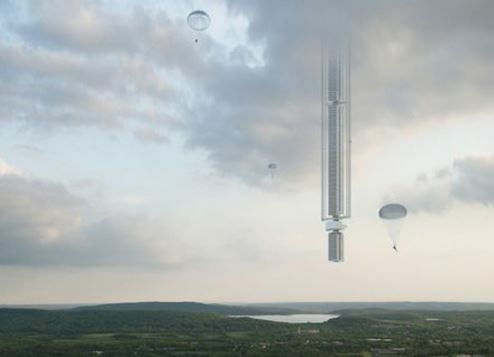 In March, New York-based Clouds Architecture Office said a skyscraper suspended from an asteroid in earth orbit dubbed Analemma Tower was a speculative idea project – “impossible to build with today’s existing technology” – but could be developed in the coming decades when it will become technologically feasible. In the same month, Dubai-based construction technologies firm Cazza announced plans to build the world’s first 3D-printed skyscraper in the city. In April 2016, the Dubai Government announced plans for 25 percent of the city’s buildings to be constructed using 3D-printing technology by 2030, with almost US$1 billion already earmarked for such projects. Dubai has already embarked its 3D-printing offensive, unveiling the world’s first 3D-printed office in May last year. It is located next to the iconic Emirates Towers buildings on Sheikh Zayed Road. Cazza’s 3D skyscraper will be built using a new construction technique called ‘crane printing’. The company will use cranes with added units that are specifically created for building 3D printed structures of 80 metres and above. “Through our technologies, we will be able to build architecturally complex buildings at never-before seen speeds,” said Cazza CEO Chris Kelsey. The company is working in collaboration with the Dubai Government to make its 3D printing targets for construction a reality. “We believe in and admire HH Sheikh’s Mohammed bin Rashid Al Maktoum’s 10X vision and shall do everything we can to bring further world-changing innovation. We came here to change the world, and that’s exactly what we’re doing,” said Kelsey.